The 4th Athens Digital Health Meetup will take place on Wednesday, September 20, 2017, at the Athens General Hospital “GNA Gennimatas” Amfitheatre. How ready are Greek Hospitals when it comes to eHealth? The GNA-GENNIMATAS Hospital administration and its doctors have taken on the challenge to open their doors to the eHealth Forum community and discuss their plans with us. General Manager of GNA Gennimatas, Mr. Vassilis Kekeris will open the session. John Sarivougioukas, Computer Engineer will speak about the Digitalized Public Hospital; Dr. George Bellos, MD, Managing Director at Health Centre Koropi, Attica will analyze the “new medical wholism pattern”, and Anastasia Krithara, Post-doctoral researcher, NCSR “Demokritos” will present “Big data for precision medicine”. Finally, a representative of the DPO Academy will discuss how the GDPR law will impact hospitals. 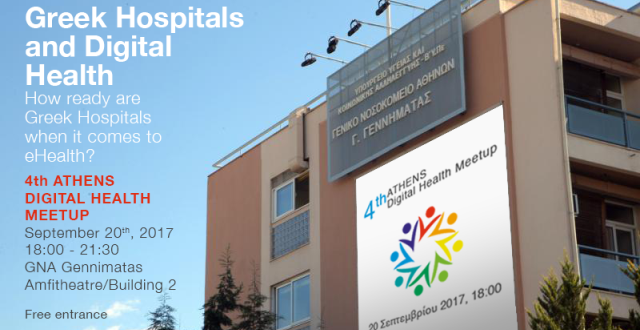 Visit the Athens Digital Health Meetup page to stay up-to date on the programme.